A goal in each half was enough for Chivas Guadalajara to secure a deserved Junior Section victory over Co Londonderry at a sun drenched Limavady. The Mexican outfit started brightly and threatened after five minutes when Kevin Mariscal found Ever Corono in the box but his shot was well saved by Ben Ryan. County Londonderry created their first opportunity on seven minutes as Jack Devenney released Nathan McCrudden, but his long range effort never troubled the Chivas goal. After 10 minutes, Londonderry had their ‘keeper Ryan to thank as he acrobatically saved from Mariscal, before being alert to keep out Fabian Marin’s header from a corner. Chivas were enjoying the majority of possession and missed a great chance on 21 minutes when Jose Ruiz was afforded too much space at the edge of the box. The midfielder couldn’t get his body over the ball and sent his effort over the crossbar. 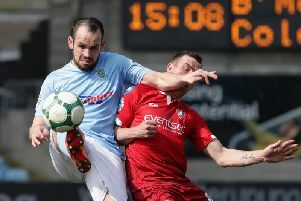 However, their pressure was finally rewarded on 22 minutes as Londonderry failed to clear their lines from a set-piece. The ball landed to Dylan Guajardo who slotted his effort into the net via the post. The second-half was a more competitive affair with Ryan Kennedy heading over from a corner as Londonderry searched for a way back into the game. At the other end, Angel Aguilera thought he had doubled his side’s advantage, but his shot was cleared off the line by Kennedy. As Londonderry pushed forward for an equaliser they were getting caught on the break and Ryan was once more alert to deny Mariscal’s well driven effort. On the stroke of full-time, Chivas clinched the match as Marin headed home from an excellent set-piece delivery after being unmarked to seal a comfortable win. CO LONDONDERRY: Ryan, Moore (Morrison ’51), Pajak (Farren ’55), McGinley, McCrudden, Devenney (Price ’43), McIntyre (Devine ’36), McLaughlin (McDonald ’60), Kennedy, McCloone, McCaul. Subs Not Used: McCann, Smyth. CHIVAS GUADALAJARA: Martinez, Ruiz, Ramos, Gonzalez (Orozco ’51), Marin, Mariscal (Ibarra ’62), Gomez, Corono, Aguilera (Arce ’56), Guajardo, Garcia (Darian ’51). Subs Not Used: Renteria, Carrillo, Torres .